In the northwest corner of North Carolina, you’ll find hip, fun Asheville. The city has gained a reputation as a charming Blue Ridge Mountains vacation destination. George W. Vanderbilt built his mansion here in the 1890s, and the house and winery attract scores of visitors each year. 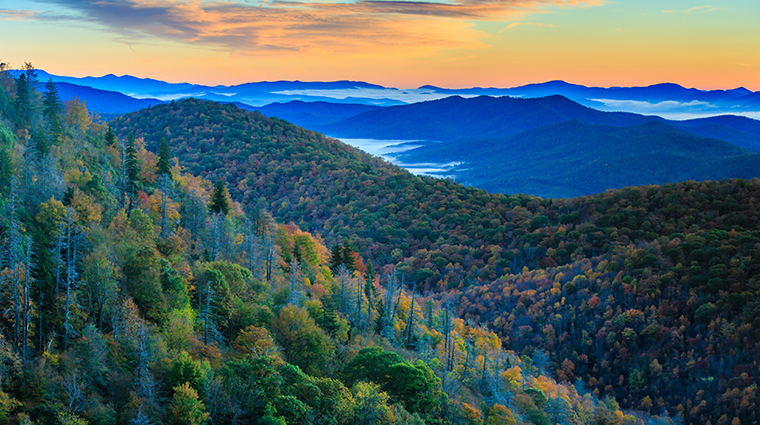 Asheville is the North Carolina city closest to the Great Smoky Mountains National Park and is also the headquarters for the Uwharrie National Forest, Pisgah National Forest, Nantahala National Forest and Croatan National Forest. If you’re looking for other mountain escapes, there are a number of nearby towns that can accommodate you. Blowing Rock has been a mountain resort area for more than 100 years. Cashiers offers scenic drives on twisting mountain roads, hiking trails, views, waterfalls, lake sports, fishing and other recreational activities. Waynesville provides mountain trails for riding and hiking, and golf and fishing in cool mountain streams. Flat Rock is also home to visit-worthy inns and restaurants. For a more cultural spot, try Cherokee. It is the capital of the Eastern Band of the Cherokee, who live on the Qualla Reservation at the edge of Great Smoky Mountains National Park and the Blue Ridge Parkway. The reservation, the largest east of the Mississippi, is shared by the descendants of members of the tribe who avoided being driven to Oklahoma on the Trail of Tears.